Carpal tunnel syndrome can cause pain, numbness and tingling in your hand. This is a result of too much pressure on the median nerve in your wrist. As this nerve travels through the carpal tunnel, it can become compressed through repetitive use. Carpal tunnel wrist braces can help to support the wrist in a position to avoid excessive pressure on this median nerve. One of the most common strategies to relieve wrist pain is to wear a carpal tunnel brace. Your physician or therapist may recommend a carpal tunnel wrist brace to provide support and to help decrease stress to the median nerve. The Mueller fitted wrist brace is an affordable carpal tunnel brace that thousands of people have tried and reviewed on Amazon. Choose your wrist size and select a right or left orientation as you order this semi custom wrist brace. The adjustable straps allow you to adjust the compression and the lightweight material is breathable and comfortable. Users have noted how easy it is to put this brace on and how quickly it relieves wrist pain. It’s worth considering if you’re in the market for a carpal tunnel brace. Many people bend their wrist at night, putting excessive compression on the median nerve. This carpal tunnel night splint keeps your wrist in a neutral position. Unlike uncomfortable, bulky braces, the ComfyBrace was designed to be comfortable for night use. If your physician or therapist is recommending a night splint for carpal tunnel, this brace is one of the highest rated on Amazon and is very affordable. The design of this brace makes it interchangeable for either wrist. Adjustable straps and loops make it customizable for varying wrist sizes. Best of all, the material is soft and breathable so you can sleep without a hot, scratchy brace on your wrist. 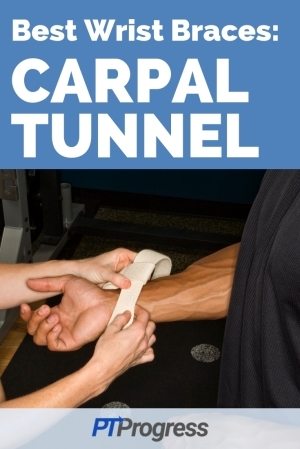 Achieving a neutral wrist position is key for decreasing stress and irritation to the median nerve within carpal tunnel. The Vive brace is an excellent example of a brace that places the wrist in a neutral position to promote healing. Like other braces, the Vive carpal tunnel brace gives you the choice of right or left orientation upon purchase. The adjustable straps and removable metal splint makes it versatile to fit your needs at home and work. Read the hundreds of positive reviews of this brace. The Vive brand is a popular brand that often has very high reviews on Amazon. The M Brace is one of the most discrete carpal tunnel braces on the market today. It looks more like a watch or activity bracelet than a wrist splint. The design of this minimalistic brace gives the carpal tunnel the ‘u-shape’ support that it needs to prevent median nerve compression. The designers also promote using this brace at night. Users of this brace provide it over 4 stars on average because of its design, functionality, and effectiveness. Repetitive motions such as typing or machine work can cause compression forces in the carpal bones of the wrist. The Brace Up carpal tunnel splint is recommended for those who need to continue to perform motions such as typing or tasks that require high dexterity. These braces are universal, fitting on both the right or left wrist. Users have rated this brace high as it’s easy to use during activities such as typing, playing sports, or with other repetitive movements.